Make choices, take chances. 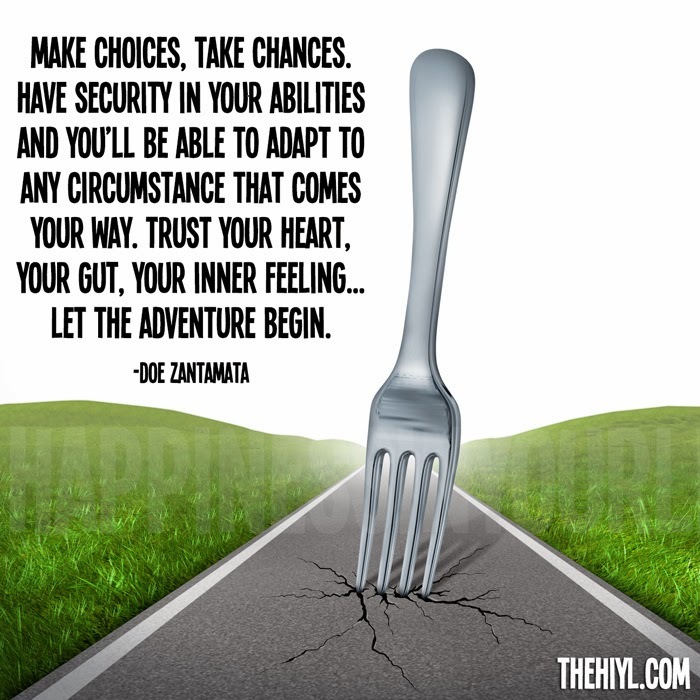 Have security in your abilities and you'll be able to adapt to any circumstance that comes your way. Trust your heart, your gut, your inner feeling…let the adventure begin. If you'd been asked 20 years ago, could you have predicted today? Who you'd know, what you'd think, where you'd be, what you had gone through? Security and knowing are for the most part false. Life is an adventure whether we realize it or not. You've chosen directions, you've marched forth. You've adapted, reflected, and followed through. So where from here? If something is great, be grateful. If something is not, choose a new direction to pursue. You've proven you can handle so much…time to let your heart lead and trust that it knows where it's going.